I got my copy of Save on Everything in the mail today, a coupon book that comes every other month and offers me savings on various things like food, squirrel control and siding for my house. I always look through it in the hopes that there will be something worth my while, like the coupons for LaFonda's. This time, there was something new. A coupon offering me three riders for the price of two ($250) at Tankride, at the Westbranch Gun Club in Princeton. The add promises me, "Ride in Real WWII Tanks and Shoot Real Machine Guns" (Gift Certificates Available). I can't quite explain the allure this seems to have as far as I'm concerned (it's probably all those WWII-era board games I play) - loading Kyle and Dan into a T-34 (with a German logo, so presumably a T-34 captured by the German's for Kursk or something, or maybe they're just trying to provide wish-fulfillment for both Russophiles and Germanophiles - ah, never mind, the site has the skinny: "This tank was built in late 1944 by the Russians. It is believed that it was captured by the Viking Division of the German Army during World War II. When we bought the tank from the Polish Government, it was painted in German field gray over the original Russian green. 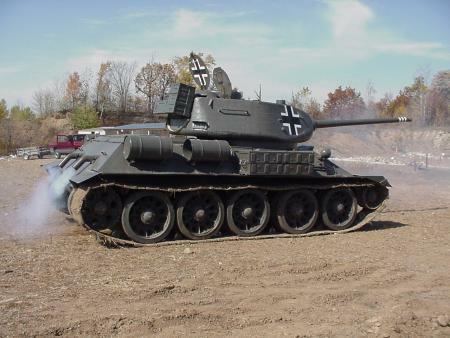 This is why we have retained the German markings on this Russian tank.") and tooling around a gun range while firing a machine gun. If they promised me I could shoot the main armanent once, I'd be seriously considering reservations. This is undoubtedly why Mean Mr. Mustard's wife has her reservations about me - she knows that deep in my liberal heart I could still find some enjoyment driving a tank around for no reason whatsoever and not feel particularly guilty that I was driving a vehicle intended to blow up other vehicles and the people therein (albeit, I'd be more comfortable driving a Sherman or T-34 without the German markings, and when confronted with buying my little girl army men or dinosaurs, I happily grabbed the plastic dinosaurs). But sometimes a 60 year old tank isn't really a symbol of anything anymore, it's just, well, an empty tin can that can safely take you back to a time with a fascinating history that you'd never want to visit in person - and wanting to drive one, well that's just the idiot in me wanting to drive something approximately thirty to fifty times bigger than my Saturn or Ford Focus. My practical side would never allow me to go on a $125-$250 tank ride. When I think about that money, I think about 6-12 months of Netflix and the 4-6 hours a week I spend watching movies with Pooteewheet, several trips to a nice restaurant for two, perhaps Sushi, a ticket to Tucson to see my parents or part of a trip to England, a large chunk of my Christmas outlay, an iPod, 1% of the flex loan I'm trying to rapidly pay down before home loans sneak back up to 10%, the tile for the bathroom I've been too lazy to finish, a serious donation to the DFL, and $500 in company-matched funds for scholarships and the arts. Taking an expensive tank ride would seem too much like just putting the money in a jar and driving over it with big treads. But if you have money to burn and tank rides are for you - tankride.com. Let me know what I missed.